Lossiemouth Town Hall will play host to an evening of top class exhibition darts featuring Dave ‘Chizzy’ Chisnall, Robert Thornton & Anastasia Dobromyslova. 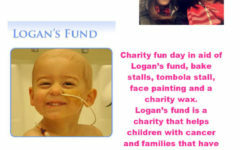 Tickets are £20.00 and available from Stuart Smylie 07974 445 776 or by emailing info@logansfund.org or from Aroma Coffee Shop. Licensed bar and hot food. There are limited spaces left for YOU to test yourself against one of these players. To enquire how please contact Stuart or email us to find out details.